All our flowers are sent by 1st class Royal Mail and the price includes delivery to any UK postcode. The majority of orders arrive the next day but we can’t guarantee a specific delivery day or time. We can deliver to any UK postal address including Northern Ireland and non-mainland addresses but are unable to deliver to PO boxes or BFPO addresses. Your flowers will be freshly picked, packed and posted to the mainland by plane or by ship. 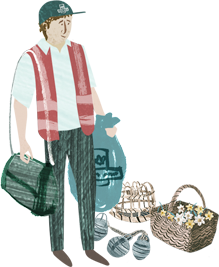 For example, if you selected a Wednesday delivery your flowers will leave the Isles of Scilly on Monday and should arrive Tuesday or Wednesday. However due to our remote location occasionally the post is delayed, usually due to weather. .....weekends and bank holidays because we want your flowers to be as fresh as possible. This is why some days are blanked out on the calendar. How do we send your flowers? We send all of our flowers using 1st Class Royal Mail they will leave Scilly by plane or ship. To enable us to deliver your flowers we do need an accurate address including the correct postcode for the delivery address. If you are having any trouble finding an address or postcode please contact us and we will do our best to help you. Your flowers will arrive around the delivery date you have chosen. Flowers will normally arrive the day before or on your chosen delivery date. Most flowers will arrive the next day after posting but we can't guarantee this, Due to our remote location delays occasionally occur, normally due to weather and the flowers might arrive the day after the chosen delivery date. It is not possible for us to guarantee delivery by a Tuesday. If you select a Tuesday delivery date, your order will be posted on Monday. Please see information below about December deliveries. All of our prices include postage and packaging so the price you see is all you have to pay. Normally we need to receive an order by 12 noon to post it out the same day. We send flowers out Monday to Thursday. Occasionally due to circumstances beyond our control it may not be possible to send flowers on the requested day. However, this is very rare and we will always do our best to ensure that your flowers arrive on time. Royal Mail are very busy in December and delivery can take longer so December delivery dates are only approximate.